Drips is a complete analogue drum voice that can be tweaked to produce kicks, snares, hi-hats and so on as well as Kraftwerk-style zaps and thwaps. I first encountered Dreadbox last year in the form of the lush-sounding desktop analogue, Erebus (SOS August 2015). Since then the company have thrown themselves wholeheartedly into Eurorack, whipping up entire systems in the time most would take to perfect a module or two. Drips is a complete analogue drum voice that can be tweaked to produce kicks, snares, hi-hats and so on as well as Kraftwerk-style zaps and thwaps. Although it arrived with an unnaturally stunted power cable, Dreadbox assure me these are usually 18cm long and that the piddly 14cm example was an anomaly. Drips differs from others in the Dreadbox Eurorack range in that it isn’t (to my knowledge) a letter of the Greek alphabet. It’s quite a large module at 21hp and consists of two VCOs, a white-noise generator, a clock source, a State Variable filter, two envelopes and a VCA. While many of these elements are simplified for percussive purposes, it’s still a lot to deal with — and the module’s curious mixture of knob and switch types doesn’t always feel like the best use of space. Nor is it obvious at a glance which of the eight jack sockets are inputs and which are outputs. For the record (since no manual is available at the time of writing) the top row comprises: a trigger input, CV inputs for VCO 1 and the filter cutoff frequency, plus the voltage output from the modulation envelope. On the lower row you’ll find the clock output, CV inputs for VCO 2 and the VCA, and lastly the module’s audio output. With no trigger connection made, the internal clock fires the envelopes repeatedly at a rate set by the tap-tempo button. Possibly this is just too small to hit reliably, or my own timing has gone wonky, but either way I never achieved a completely tight sync with it. If Drips were to be your main clock source, the red LED would be the only tempo indicator. I suspect most will use an external trigger instead, in which case the LED switches to reporting the incoming voltage blips, although the internal clock continues to be sent at its own unfathomable tempo. That might be useful for something, who knows? The two VCOs are equipped with FM and cover a pitch range of 10kHz down to 1Hz — so well into LFO territory. A simple modulation envelope sweeps either the frequency of VCO 1 or the filter’s cutoff, and a bipolar control sets the amount. As this control is notch-free, you sometimes have to listen carefully when trying to completely eliminate modulation. Happily, the pitch or filter sweeps are fast, zappy and well capable of a healthy range of kicks and toms. Although Drips has two envelopes, you’re only given control over the decay of each because, unsurprisingly, the attack is instantaneous. The oscillators offer square or sine waveforms (the latter actually a sine/triangle combination). When VCO 2 is set as the FM source, it opens the door to a metal yard full of clanks, dinks and ringing hi-hats. 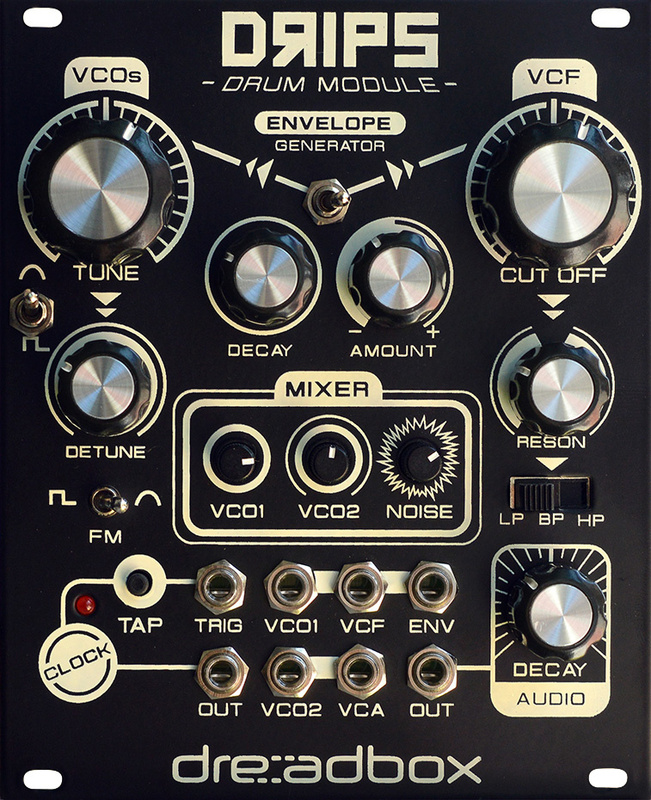 The large frequency knob controls both oscillators at once, with the smaller detune used as an offset for VCO 2. The word detune probably undersells it though, because its range crosses many octaves. While Drips is primarily aimed at drums and its VCOs aren’t finely calibrated, I found it was possible to produce sequences and bass lines that were pretty much in tune via the CV inputs. I also noticed that Drips could be driven much harder by external envelopes or the velocity sent from an Arturia Beatstep Pro, learning later that the recommended voltage for any input is 0-5V, although up to 12V is catered for. With just the oscillators and noise generator, it’s relatively easy to carve out snares, congas, claves, blips, thunks, triangles and more. The multimode filter (adapted from the Erebus) provides a further layer of analogue warmth, its 18dB/octave design capable of self-oscillation at high resonance. Via a plastic switch you can opt for fat, twangy or thin (LP, BP or HP) responses, with the band-pass mode also adding a distinctive ‘click’ to each trigger. The filter is sensitive to the level of noise in the mixer, with the cutoff frequency shifting for each small increase in gain. And at high resonance settings some noise leakage is evident. When set in a regular Eurorack case, Drips’ large text and graphics seem slightly naïve compared to most other modules. In an ideal world, there might have been a few extra connections too; my vote would have been to have an external input to that classy filter and maybe direct access to the oscillators’ raw output. However, Drips is keenly priced considering the features included, and is capable of a generous spread of thumping electronic percussion voices. Great fun!